At Governor's Direction, Stepped Up Security from National Guard, State Police, Port Authority and MTA at all Major Transit Hubs Downstate Including JFK, LaGuardia, and Penn and Grand Central Stations. 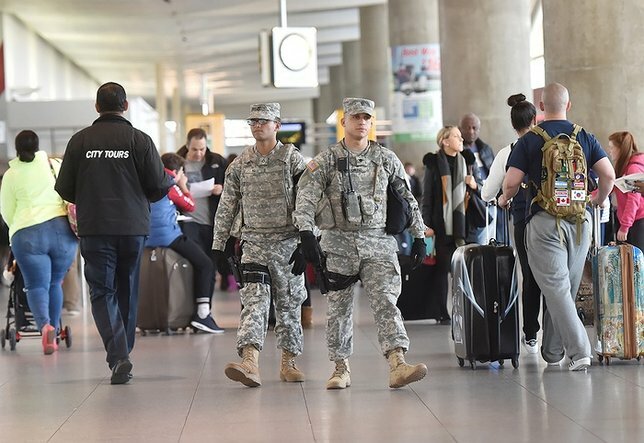 At Governor Andrew M. Cuomo's direction, the New York National Guard this morning activated its quick reaction force from Fort Hamilton to provide additional security detail at JFK International Airport following the deadly terrorist attacks in Brussels. Albany, NY - March 22nd, 2016 - At Governor's Direction, Stepped Up Security from National Guard, State Police, Port Authority and MTA at all Major Transit Hubs Downstate Including JFK, LaGuardia, and Penn and Grand Central Stations. "The senseless attacks that struck the people of Belgium earlier today have left us all stunned and heartbroken. These were acts of pure evil that have claimed the lives of people who were doing nothing more than going about their days. My heart grieves for all those who have been impacted, and as we learn more about these attacks, New York will continue to stand shoulder to shoulder with the international community against terrorism – as the world has done for us in the past. And as we have seen time and again, when we are united, terror has never prevailed and never will. On behalf of all New Yorkers, I offer my thoughts and prayers to the people of Belgium on this tragic day." "I have directed state law enforcement officials to step up security at high-profile locations around the state, including our airports, bridges, tunnels and mass transit systems. Public safety is paramount, and I want the people of this state to know that we are working with all local and federal partners, remaining vigilant and taking all necessary measures to keep New Yorkers safe." The New York National Guard this morning activated its quick reaction force from Fort Hamilton to provide additional security detail at JFK International Airport. The National Guard has 400 service members on duty today in the NYC area. The Guard is adding an additional service members to transportation infrastructure hubs downstate, including JFK and LaGuardia airports. The Port Authority is increasing its police presence at all of its airports, bridges, tunnels and the World Trade Center, as well as the PATH and Port Authority Bus Terminal. The MTA is coordinating with New York State Police and the Port Authority to elevate its police presence at subway and rail stations in NYC, Westchester and Long Island. The State is also in active coordination with local and federal partners, including the FBI's Joint Terrorism Task Force and the New York City Police Department. Subject: LongIsland.com - Your Name sent you Article details of "Governor Cuomo Announces Increased Security at Major NY Transit Hubs"